I mentioned in an earlier post Darrell Guder’s definition of Christendom as the “centuries in which Western civilization considered itself formally and officially Christian” (Missional Church, pp. 5-6). It was an era that emerged when the church moved from the margins of culture to the power center of culture. It happened when the Roman Emperor Constantine converted to Christianity. You can read more about that here. This event changed the nature of Christianity and the way the church understood its purpose for the world. 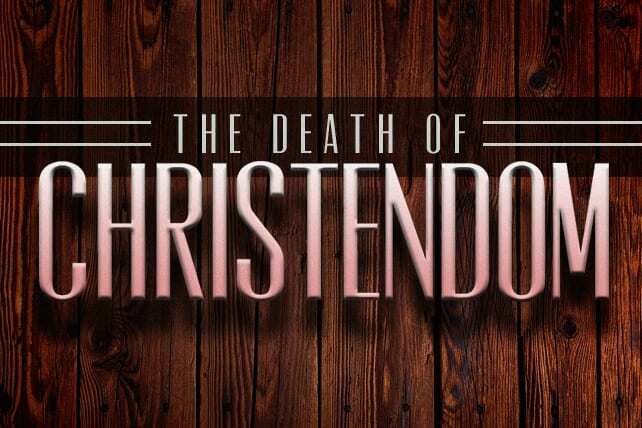 ​Christendom affected the way the church perceived the world and its ministry to it. “In Christendom,” says Kreider, “everyone is a Christian” (The Change of Conversion and the Origin of Christendom, p. 94). In other words, there is no category for people who are not Christians. In Christendom, babies are baptized as soon as they are born and you belong to a parish simply because you live in a particular village. As a result, there’s no difference between people who have chosen of their own volition to put their faith in Christ and those who have not. ​But human beings are prone to making distinctions. So, a new distinction emerged. As Barry A. Harvey puts it, in “Christendom the fundamental division is not between church and world, but between clergy and laity” (Another City, p. 95). This division resulted in a new caste system of sorts. Now there was a caste of Christians who provided spiritual leadership. There were “professional” Christians and there were “ordinary” Christians. ​And what did these new “professional” Christians do? They provided spiritual services for those who were considered to be “ordinary” Christians. ​The effect of this new distinction was that ministry became something that was performed by only a select few—namely, the clergy. With that kind of framework, the church’s ministry no longer revolved around participating in God’s mission in the world, as it had in the time before Constantine. Rather, “in Christendom societies, mission often received little emphasis, for the churches concentrate upon the pastoral care of their people and the maintenance of their structures” (The Change of Conversion and the Origin of Christendom, p. 96). ​When everyone is considered a Christian, mission becomes obsolete; and when mission to those outside the church is no longer necessary, the church must find a new reason to exist. ​In Christendom, the purpose of the church had nothing to do with reaching people with the message of Jesus and inviting them into relationship with their Creator (because “everyone is a Christian”). Rather, the purpose of the church was to provide spiritual goods and services to those who are considered to be ordinary Christians. ​In other words, when inviting people into the kingdom of God becomes unnecessary, the church has to find other reasons to perpetuate its existence. ​Without a doubt, Christendom was a dominant force in Western culture for about 15 hundred years; but that era has come to an end. Christianity no longer has a place of prominence in the nations and societies that make up Western culture. Gerhard Lohfink states that “the illusion of living in a completely Christian society has been definitively and thoroughly demolished in our day” (Jesus and Community, p. 132). ​As evidence of this, Kreider points out that “throughout most of the West, Christendom is in a state of decrepitude if not decomposition. In many countries shoppers flood the malls on Sundays, while Sunday morning has become a special time for sporting events” (The Change of Conversion and the Origin of Christendom, pp. 98-99). ​The death of Christendom has certainly been evident in the churches I’ve been a part of, and I bet it has at your church, too. Whereas the oldest generation tends to faithfully attend church every Sunday, younger generations attend far less frequently. ​Soccer tournaments, gymnastics competitions, weekend getaways and professional football games on TV exert a powerful draw on younger folks at our churches. ​Please understand, I am not condemning those who aren’t at church every Sunday. Lower church attendance is simply evidence of our new Post-Christendom reality. Next articleLee Strobel: Why Does God Allow Tragedy and Suffering?